Opinion, news, politics—discussion abounds with questions of feminism, gender identity and expression, misogyny, and the patriarchy. Domestic and sexual abuse cases involving celebrities and sports heroes come to light with disturbing frequency. Street harassment draws the ire of much of society. Male coworkers (or bosses) cannot use terms such as “sweetie”, or “girls” without sounding patronizing. Society is gradually becoming accepting of more fluid gender role actualization and a non-binary view of gender. These manifestations of shifting cultural norms mark significant progress. So how does one approach a movie from another age, based on a book from several decades before that, in which the protagonist objectifies women as casually as James Bond? Zorba the Greek, while retaining a certain timelessness and magnetism, struggles to translate to the present day, due in no small part to the ubiquity of archaic gender role assumptions and the objectification of women. Alexis Zorba in Michael Cacoyannis’ 1964 film Zorba the Greek, based on Nikos Kazantzakis’ 1946 novel, personifies the paradox of being a charming chauvinist. A gruff womanizer who objectifies women throughout the film, Anthony Quinn’s Zorba still infects the viewer with his unflinching attitude toward life. He talks about widows being easy, women needing men, and men having a responsibility to sleep with women, going so far as to say it is a sin when a woman sleeps alone. While Zorba’s approach to women (and life) shocks Basil, a young Englishman played by Alan Bates, he does not express disapproval so much as incredulity at Zorba’s willingness to voice such thoughts so unabashedly. While he does not initially understand Zorba, he grows to appreciate Zorba’s insatiable thirst for life, even in the face of adversity. When compared to the Cretan villagers, however, Zorba’s penchant for subscribing to sexist mores seems almost progressive. But he understands the villagers in way that Basil cannot. In one particularly haunting scene, the widow, played by Irene Papas, falls victim to the villagers’ societal expectations. She cowers, dressed in black with her jet-black hair and dark eyes, set starkly against the sandy Cretan landscape, clinging to a lone tree, like a scared animal—the effect is nauseating. What has sparked this need for vengeance? She refused the advances made by a young village boy, apparently driving him to suicide; she said “no”; she refused to conform to the village’s idea, outdated even at that time, that she had no right to remain single. In their view, a woman should be married, even if she is widowed—one of the men (or young men) must be suitable, and she should choose among them. Does Basil understand this? Yes and no. He understands the resentment but not the magnitude or the sheer brutality of the reaction. As a viewer, the collective reaction and acceptance of violence as justice comes as a surprise—one might expect it more from a story occurring several hundred years in the past or a Roman Polanski film. Zorba, however, does understand it—both the impetus and the reaction. He doesn’t agree with it, but he does not find it shocking either. He attempts to save her and chastises the villagers, calling them an embarrassment to Crete. He ultimately fails; and the young boy’s father takes a knife to her throat and kills her. Zorba resigns himself to the fact that the Cretan villagers way of things is simply the reality, rather than truly challenging the status quo. By today’s standards, his resignation falls short of heroism or admiration as it relates to gender equality or women’s rights. But the film never tries to portray him as any sort of hero, so that judgment is beside the point. The womanizing and sexism of Zorba presents a legitimate dilemma. However, could one reinterpret Zorba to fit today’s cultural norms and shift toward accepting gender equality, redefining gender roles, etc. or does his womanizing and misogyny define his character? He exudes a certain respect and appreciation for women, while also referring to them another species entirely. This encapsulates the paradox of his character, while also providing hope that the former holds and his sexism and womanizing are merely products of his time, rather than the individual. But if the latter holds, then embracing that behavior conflicts with supporting gender equality and progress. His exuberance, the sparkle in his eyes, the hint of madness, the humor, the eating and drinking and dancing—these captivate and inspire the viewer. Basil’s asking, “Teach me to dance, will you?” represents a thoroughly satisfying catharsis and makes the viewer want to dance and appreciate life even when dealt a bad hand. There is still a life-affirming lesson one can draw from Zorba and his resilience in the face of disappointment and failure—learn to accept that something has not worked out and still enjoy a leg of lamb like Tom Jones, have few drinks, dance on the beach, and live. But that does not mean one should brush aside the extremely problematic objectification of women (the widow, Madame Hortense, his past wife, lovers, and Lola). 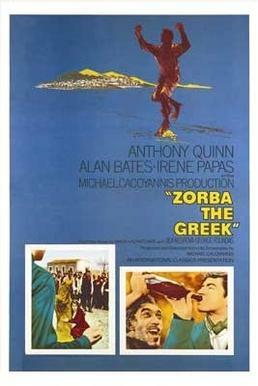 While it is a component of his character, the multifaceted nature of Zorba leaves room to imagine that today’s Zorba would not hold those same views. Zorba was nominated for Best Picture the same year as My Fair Lady, Mary Poppins, Dr. Strangelove: How I Learned to Stop Worrying and Love the Bomb, and Becket. My Fair Lady took home the prize, and while Zorba is arguably more interesting, the 1964 movie musical inspired by Pygmalion, is an impressive and more universally uplifting film, with the male lead actually reforming his initially sexist, classist views. My Fair Lady and Mary Poppins are still popular, and Dr. Strangelove has become a cult classic. Zorba failed to catch on in that way, although the character of Zorba lives on—just preferably in a more enlightened incarnation, befitting the love and appreciation he claims to have for women. Many works could be examined through this lens… Mark Twain’s treatment of race… or the Marx brothers treatment of race.